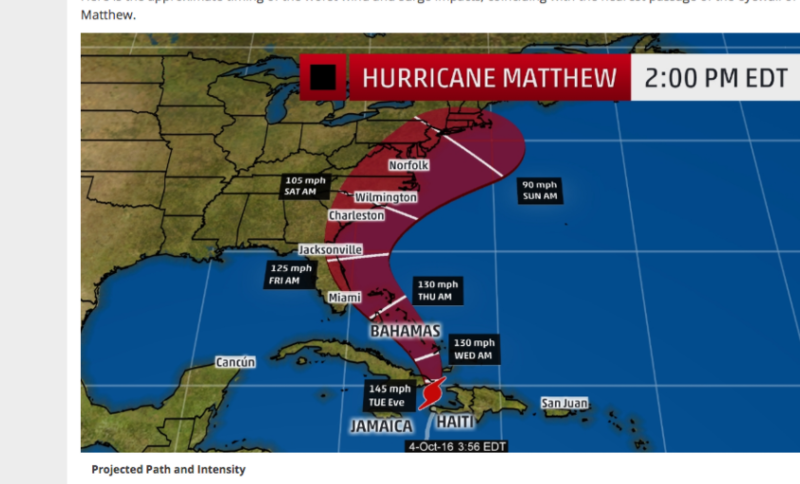 Homebrewers on the US’s East Coast know that Hurricane Matthew is projected to skirt the eastern seaboard, dumping lots of rain on coastal cities. Florida is already warning residents to prepare for the possibility of power outages and perhaps the need to evacuate some areas. All residents in the possible track of the storm should be ready to take precautions. Luckily, as a homebrewer, you have a leg up when it comes to storm preparations. After adequate shelter, the next most important thing required to survive an emergency is a supply of fresh water. Homebrewers can fill empty Corny kegs or fermenters prior to the storm and have a reserve of water. Just clean the vessels first and fill them with fresh water. The World Health Organization (WHO) estimates that roughly 5.3 gallons (20 L) per day per person should provide enough water for drinking, cooking, and sanitary needs. Corny kegs and plastic bucket fermenters are the best choice as glass carboys can break. The next most important thing after water is food. But, we all know that there’s food and then there’s food. If your power and/or gas is out, you won’t be able to use your stovetop, oven, or microwave. However, if you fill your propane tanks before the storm, you can use your brewing burners to cook while your neighbors eat cold soup out of a can. You can also use the burners to heat water for cleaning dishes, washing clothes, or other purposes. In a flood, wounds can easily get infected from contaminated water in the environment. In a pinch, iodine from your iodophor sanitizer can be used as a disinfectant. (Note: it is supremely uncool to sue homebrewing websites for bad medical advice.) Likewise, in a flooded area, being able to sanitize plates, cups, and utensils for food service could come in handy. Odds are it won’t come to this, but if it does, you’re prepared. Finally, as a homebrewer, you likely have a good supply of beer on hand. In an emergency — when the power is off, your TV doesn’t work, and you can’t access the internet — you can at least sit back and enjoy a beer while you wait for things to blow over. So, there you have it — just being a homebrewer makes you more prepared in a weather emergency. Unfortunately, it doesn’t help with the other critical situation plaguing our nation — the clown crisis. If you enjoy Beer and Wine Journal, please consider supporting us by clicking on one of the donate buttons. Thanks. Also, my book — “Home Brew Recipe Bible,” by Chris Colby (2016, Page Street Publishing) — came out September 20 and is available from Amazon and Barnes & Noble. You can also find the nearest independent bookstore that sells it on Indiebound. From the bad advice from brewing websites department: Hops are antimicrobial. For shallow cuts, noble hops are recommended. For deeper gashes, high alpha American varieties are traditional. Some doctors have seen positive results from new varietals from New Zealand, but these remain unproven in the eyes of the wider medical community.